I had to blink hard and rub my eyes when I read the news article “ Shoes that works as Mobile Phone” . It made me think that I am not abnormal. I always wanted a printer which would make my photos look muscular, a clock to take the dog for a walk and a washing machine which throws away clothes which are never worn more than once and sale signs which would disappear when one walks by. I seem to be having lots of these, not ideas but clothes which are worn only once - in shop's trial room. It will be save me lots of money or otherwise I need to buy a separate house to store the clothes. Going back to the shoes that think is that it would lead to better flexibity among the users. 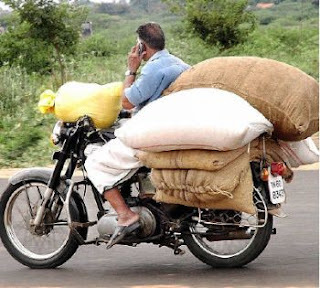 Currently in Bangalore, India whenever the mobile rings while driving a bike, the rider just shoves the phone between the ear and the shoulder in to a popular yogic pose called Mobile aasan. The picture below shows a variation of the pose it is called one hand phone pose. Now imagine if the person wears the shoe mobile. It would definitely not only increase flexibility of the wearer but also of the reflexes of the folks who wants to get off way of the rider. I always recollect that we have run out of ice, only after pouring the drinks in to the glass. The invention which I am definitely waiting; Ice cube trays which will automatically walk and fill themselves when they are empty. I would like to see the look on the face of the guests when the fridge door opens and the ice tray stepping out to fill itself. Thanks man for the encouraging comments. It also made me re-read the piece and correct some obvious mistakes. Mobile phones might be banned in dressing room of cricketers. But they can't ban shoes, can they? We can expect betting in cricket to take a new turn with this invention and IPL can become even more interesting. Let me cross my ankles...I got a call coming! Ganeshmal Tejraj is Presenting a variety of high quality Stainless steel utensils, Plate warmer, Sink unit manufacturer, Steel hammered table ware Bangalore, M.S.Utensils, Sugar candy machine in Bangalore.